The Equitrekking team, including host and equestrian Darley Newman, recently traveled to Botswana, Africa to ride in Tuli with Limpopo and had an amazing experience. Contact us for first hand information on this trip! We've done it! Botswana Limpopo Valley Horse Safari in the Tuli Block, an area of great diversity, magnificent vistas, ancient civilizations and dramatic rock formations bordered by the great Limpopo River in the south. While on these African horseback safaris, you may stay in bush camps, under canvas, enjoying all the necessary comforts of a mobile safari or in lodges, depending on the trip that you choose. If you want to view elephants and perhaps also lions, or leopards, then this is the ride for you! Enjoy quality horses that have been schooled to a high standard and are well cared for, as well as guides who pay attention to not only the large mammals, but to the ecology and history of the area. Non-riders may also enjoy these safaris and instead of horse riding, try other activities. The summer months are September to April, with October, November and February being the hottest months. Temperatures vary from 50°F (12°C) to 100°F (38°C) at midday. The rainy season falls between November and March. Winter is May to the end of August, and is a period of very little rain, delightful temperatures by day, and refreshingly cool temperatures at night. Temperatures during winter months vary from 40°F(4°C) to 75°F (24°C) at midday. Helmets are required and you must bring your own with you. It is important to bring half chaps, riding boots and sunscreen. Towels, water bottles, and soap are provided. There are laundry facilities on site. Please visit Equitrekking Travel's packing list for other suggestions. The horses for these horseback safaris have been individually selected for their temperament and ride-ability. They have been carefully chosen from the various South African breeds, which are well known for being of a tougher nature and able to cope under extreme conditions. These breeds include the Boerperd, Shire Cross Thoroughbreds, Appaloosas, and the S.A. Warmblood. They range in size from 14.3 hands high to 17 h.h. Limpopo Valley Horse Safaris prides itself on having horses that have been selected with the same stringent criteria as those selected for eventing and other equine competitive sports. The horses are schooled in classical English style, although they neck rein when in the bush. All rides are conducted by two experienced professional guides. The lead guide is armed with a rifle and a bull whip. All management staff and guides do regular first aid training with a specialized Doctor for remote areas. The lead guide has a local phone and a satellite phone and a radio for use in emergencies. Good quality, comfortable English saddles with saddlebags that include water bottles. There are a few Australian stock saddles and South African McClellans available for those who prefer. These equestrian vacations encompass mobile safaris, different wilderness camps, and luxury lodges throughout a vast nature reserve. There is a high possibility of seeing elephants, lion, leopard, cheetahs, wild dogs, and much more plains game, as well as over 350 species of birds. The Northern Tuli Game Reserve (about 120,000 hectares), an area of history and legend, offers some of the most exciting game viewing in Africa. It is located in the remote northeastern corner of Botswana, at the confluence of the Limpopo and Shashe Rivers, an area known historically as the Tuli enclave, a diverse wilderness of savannah, forests, marshland, open plains and sandstone outcrops. The terrain comprises a network of dry riverbeds, rocky sandstone outcrops and high ridges with views that stretch for endless miles across Africa’s game-rich plains. It is a place of exceptional beauty and one ideally suited for exploration from the back of a horse. The Northern Tuli Game Reserve, an area of history and legend, offers some of the most exciting game viewing in Africa. It is still home to large herds of elephant, prides of lion, cheetah, and wild dogs. Along the river courses, huge riverine trees provide shade for eland, impala, wildebeest, giraffe and zebra, whilst at night, the bat eared fox, African wildcat and the magnificent leopard search for prey. Some 350 species of birds may be seen. The Northern Tuli Game Reserve proudly provides a refuge for one of the largest, single population of elephant on conservation land in Africa. Known as the relic herds of Shashe, these elephants are the last living testament to the great herds that once populated the meandering Limpopo Valley. Today, the population is estimated to number in excess of 1400 animals. Afternoon game walks and night game drives may part of your itinerary. In addition to the game experience, Mashatu offers notable archaeological sites including the Mmagua Ruins. Non-riders can be accommodated. Some activities offered are walking, cycling, or game drives. Two highly trained, experienced bush chefs will look after your every need on your Africa horse safari. Breakfast is usually buffet of freshly baked muffins, cereals, toast and porridge. Lunch is a buffet, usually quiches, salads, and fruit for dessert. Dinner is a 3 course meal served at a table, often under the canopy of stars! Vegetarians and other special diets can be accommodated with prior notice. Please let us know your special dietary needs at the time of your booking. Please see each respective itinerary for accommodations, as they range from lodges to tented camps, depending on the trip. Guests must be experienced riders. 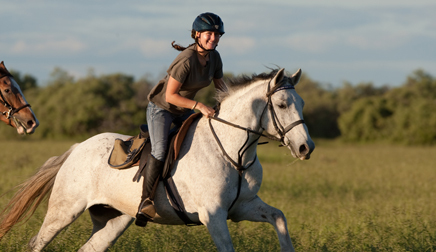 You must be fit and comfortable for long hours in the saddle and should ride regularly (at least once or twice a week) and be comfortable at a canter and gallop, as well as being able to jump small jumps should it be necessary. The horses are mostly English schooled, so it is highly recommended that Western riders have a course of lessons in the English riding style prior to arrival. Non-riders can be accommodated on these trips. Some activities offered are walking, cycling, or game drives. Children under the age of 16 years are usually not permitted unless the child is a very strong rider and accompanied by parents. Join us on safari and ride with a herd of giraffe or zebra across the plains, track elephant or buffalo from island to island. Be part of this unique herd, cantering and splashing through lagoons of the Okavango Delta with Lechwe or simply watch the setting sun whilst listening to the calls of lion and hyena. In addition to the set departures the Best of Botswana safari can also be tailor-made for groups of four or more. Included: 5 Nights Accommodation Tuli, 5 Nights Accommodation Macatoo Camp, all activities, meals, selected local beverages and laundry service, all internal transfers and charter flights and VAT. Includes one way flight ORT to LHS, One Way flight LHS direct to Macatoo, One way flight Macatoo to Maun. * Prices are subject to fluctuations due to currency changes. Please note that the following itinerary is an example. The day to day riding will be dependent on game movements and local conditions. Day 1: Upon arrival you will be met by your guide and transferred to our reception area by the stables. After a light lunch it’s time to head off to meet your horse for the week. You will embark on a short introductory ride to make sure that you and your horse are well suited and then ride out to camp, where supper will be served in the Llala palm dining room of the Two Mashatus Camp. Day 2: The day begins at sunrise with tea or coffee brought to your tent, followed by a light breakfast. Mount up and head off from the dense woodland along the Limpopo River towards the shallow rocky hills that mark the edges of the great river valley. Your destination for night two is Kanda camp, a rustic series of cabins atop the steep banks of the Majala River. Here in the heart of the Mashatu area the game is plentiful. The Tuli area is home to one of the largest herds of free roaming Elephant south of the Zambezi and you are almost assured of great viewing of these incredible creatures. After lunch and a siesta you will take a gentle ride in the cool of the afternoon to explore the Kanda area. Dinner is prepared over an open fire and enjoyed in the thatched lapa overlooking the river. Day 3: An early wake-up call heralds a new day and breakfast is served around the log fire pit. Today, your journey takes you through the heart of Mashatu to the ancient rock formations synonymous with the Limpopo valley. Giant Baobabs silently surveying the land as they have for centuries, ancient elephant trails stamped into the soil and wonderfully long canters around the open scrub. This ride brings you to the banks of the Motloutse River and amongst dense old Mashatu trees a leadwood boma that we call “Kgotla” after the old tribal court that was once held in its enclosure. The open-air traditional African enclosure gives perfect security to nights spent under the stars and a unique experience of the African bush up close and personal. Day 4: Is a choice of either a morning and afternoon ride exploring the amazing sandstone formations including the famed Solomon’s Wall. Some of the oldest civilisations in southern Africa had their settlements in this valley, their kings safely nestled in royal kraals at the tops of these flat topped hills. The Mapungubwe topography is ancient and timeless, and combined with great wildlife sightings, it is certainly an incredible riding experience. Or the group may prefer a long morning ride and an afternoon excursion to the nearby village of Lentswe Le Moriti and the basket weavers followed by a trip to the Mmamagwa hills. At the end of a short easy climb and beneath a beautiful Baobab you are rewarded with a breathtaking view of the Tuli area with South Africa to the south, Zimbabwe to the north and Botswana around you, this a sundowner drink you will remember for many years to come. Day 5: An early rise and hearty breakfast is a good start for what is probably your longest day on horseback. Winding your way through the Mopane bush, with the chance of sighting elephant, you will make your way to the rich plains area close to the Limpopo River. Liana Camp is snugly nestled amongst giant Mashatu trees that line the Liana lagoon, a tributary to the Limpopo River. To ease your aches we use the afternoon for a game drive that takes us deep into the reserve in search of the big cats the area is renowned for including leopard, cheetah and lion. Day 6: Today is your last day in the Tuli and begins with your final early morning tea/coffee and breakfast snack over the open fire. The morning is spent riding along the Limpopo River. We head back to the stables where fond farewells are made to your steed. This is a shorter ride of about two hours, allowing you to get back to the stables with enough time to enjoy a hearty brunch and to get ready for departure as you board the light aircraft flight onwards to the magical Okavango Delta from a birds eye view. Macatoo camp, that overlooks a seasonal flood plain lagoon, is a short game drive or (depending on the time of year) an exciting boat ride from the airstrip. After a quick look around camp and lunch under the trees, there is usually time for a siesta before tea, and the evening ride where you can get to know your horse. You return to camp for a hot shower and candle-lit safari dinner. Day 8: Wake up as normal with freshly-brewed coffee or tea and depending on your whim, either ride out again (perhaps to find the rare semi-aquatic antelope, the red lechwe), or join one of our guided walks, game drives orperhaps a spot of fishing for bream from the boat? The riders and non-riders can meet up for a delicious champagne breakfast under one of the large baobab trees. After lunch take the opportunity to relax and either swim in the pool read a book or organise your photos. Homemade tea and cake is followed by the sunset ride, exploring the lower flood plains where elephant often gather at a pool. As dusk closes in, it is fascinating to watch them interact in the wild, and being on horseback brings you that much closer. Day 10: This morning we ride deeper into the heart of the delta, along some of the high palm islands which offer great sweeping views of the Delta plains. After tea we'll do a slower ride to our magical tree house where you will have the option to spend the night out, sleeping high up in the tree tops under the stars. To be out in the wilderness so freely in the Okavango bush like this is a wonderful experience and one that few people experience. Day 11: After waking up amongst the trees to the call of the African Fish Eagle, the next morning we splash through water on the vast open plains, home to blue Wildebeeste and Burchell's zebra. The riding may be fast as we approach deep reedy areas full of bird life including Open-billed storks, Squacco herons, Slaty egrets, Egyptian geese and many more. We return to Macatoo along the myriad of waterways lined with large trees. Once back there will be time to pack and say goodbye before we drive you to the airstrip with a picnic lunch. We are sure you will never forget the true sense of freedom which you will experience on your horse in the African bush. Tuli: Wilderness/Satellite Camps -Satellite campsites are set up in specific locations throughout the Mashatu Reserve. Accommodation is in A frame tents on comfortable beds with sheets and duvets. Facilities include a bucket shower and “bush-WC”. Meals are cooked over a camp fire. Tuli: The Kgotla - The Kgotla is an old tribal court from a nearby community that was relocated to the banks of the Motloutse River on the western periphery of Mashatu. The boma is an open-air traditional African enclosure made up of leadwood logs. Guests sleep on beds around a large log fire which blazes at the centre. Tuli: Two Mashatus Camp - Nestled in the shade of a centurion Mashatu tree, two traditionally built Lala palm rondavels serve as dining area and lounge. Accommodation is in big A frame walk-in tents pitched on teak platforms, with en-suite enviro loo and hot water shower. Each tent is private and positioned in the shade of a tree with a small deck area on which to relax during the afternoons. Okavango: Macatoo Camp is situated on the western side of the Okavango Delta. Covering 17,000 km sq, the Okavango is the largest inland delta in the world, a mix of labyrinth channels, palm fringed islands and fertile floodplains. Our stunning camp features eight large luxury en-suite safari tents on raised wooden platforms overlooking floodplains where elephant, zebra, buck and the birdlife can be seen by visitors from their private verandahs or even bed! Centrally there is a large well-appointed mess tent and tucked away, a private pool. On this riding holiday you are offered the chance to combine exciting game viewing with discovering elements of South African and Botswana history. Not only will you see the African bush and it’s magnificent wildlife but you will also learn about the rich history of the Waterberg. The Botswana section is based at Two Mashatus Camp in February, March and November and uses mobile camps between April and mid-October. The South Africa section is at Camp Davidson all year. Included: All Rates are inclusive of a massage, drinks, laundry, rides, accommodation, food, guides, etc but exclude transfers/tips and/or purchase of personal items or gifts. Not Included: Tips. International flights to Johannesburg. Closest Airport: Johannesburg. Flights are available with a variety of airlines. Accommodations: At Camp Davidson you will stay in decked canvas tents nestled amongst the sandstone ridges overlooking grassy valleys. Each tent is appointed as it would have been in Ted’s day with classic items that would have been essential to the traveller accustomed to regular nights in the bush. The A-frame tents have beds, sheets and duvets. Each tent also has an ensuite bathroom area with bucket showers. There are jug and basin hand wash facilities and flushing toilets. The Botswana section is based at Two Mashatus Camp, a semi-permanent tented camp. There are five comfortable and roomy tents, each on its own raised teak platform, with en suite ‘enviro’ loo and bucket shower with a view. The century old Mashatu tree provides shade and there is a central dining area built in the traditional Botswana style with lala palm thatch. The lounge area has comfortable sofas and hammocks for relaxing between activities. The camps at Limpopo are not enclosed and a real treat will be to see game in and around camp. to encounter our pod of resident hippo, before climbing the ridge backto Camp Davidson. A full days ride west of camp takes you around Bellevue on the southern end of the property and on to the historic Baber homestead for lunch by the poolside. That afternoon riders visit the local Sotho village and have a tour of some of the traditional houses with the local characters Martha Mosima and the group of village lady elders for afternoon tea accompanied by traditional singing and dancing. After a day of long riding, culture and history you will return to the tranquility of the Camp Davidson where dinner is served under the stars. An early departure from camp for a game drive at a nearby Big Five private game reserve, with a chance to see rhino, lion, elephant, buffalo and leopard. On the way back we will visit Beadle, a craft workshop on Triple B Ranch which has a community upliftment project since 1998. The crafters specialise in beautiful handmade beadwork and leather products including riding chaps. Lunch will be served by the pool at the Horizon horseback Signature Safari lodge, before heading back to the camp for a sundowner ride in the game reserve. We break camp early and riders mount for a last ride through the reserve, soaking up the early morning sights and sounds of the African bush to the Signature Safari lodge. Guests will depart from depart from the lodge at 7.30 and are transferred to Limpopo Horse Safaris in Botswana. Cross the Limpopo river and into the Tuli block, before arriving at the stables. An introductory afternoon ride will familiarize riders with their horses for this leg of the safari, arriving at teh Two Mashatus camp in time to freshen up before supper. An early wake-up call with tea/ coffee brought to your tent, followed by breakfast around the campfire. We make an early start each day to enjoy the freshness of the morning and to maximise game-viewing opportunities in the hours that the wildlife is most active. Undoubtedly we will come across the large herds of elephant for which the Tuli is renowned, as well as many different species of antelope; also giraffe, zebra, bat-eared fox, jackal, hyena and possibly even lion, leopard, wild dog and cheetah. Later ride along the Limpopo River, enjoying the rich birdlif, spotting crocodile in the pools and learning about the magnificent trees lining the banks. Alternatively, you have the option of doing a game drive, game walk or visiting the local village Mothabaneng to see the local ladies make baskets as well as have a look at some bushman paintings. Ride out following the movements of wildlife in the area and observing and interpreting the world around us. The tempo of the rides is always varied and depending on the terrain, there are opportunities to enjoy the spirit and fitness of the horses at a faster pace. After a last morning ride back to the stablesthere is time for a quick shower and brunch at the reception area before heading back to Johannesburg International via Pontdrift border post. This classic and most popular riding safari, the Tuli Safari, is a seven night mobile safari, which covers approximately 120 miles over the course of the week and is scheduled from March to October. Each riding day ends at beautiful camps with welcoming walk-in tents, full size beds, fresh cotton linen and hot showers. The safari embraces fine dining in the wilderness and every evening is a delightful mix of good food and good company. * Prices are subject to changes based on currency conversions. Single rooms are not guaranteed single accommodation for all safaris - subject to availablity at the time of Safari. All Rates are inclusive of a massage, drinks, laundry, rides, accommodation, food, guides, etc but exclude transfers/tips and/or purchase of personal items or gifts. International flights to Johannesburg return. Transfers: A shared road transfer from Johannesburg at a pre-set time is available for further cost. Tips are payable locally and also not included. Day 2: The day begins at sunrise with tea or coffee brought to your tent, followed by a light breakfast. Mount up and head off from the dense woodland along the Limpopo River towards the shallow rocky hills that mark the edges of the great river valley. Your destination for the night two is Kanda camp, a rustic series of cabins atop the steep banks of the Majala River. Here in the heart of the Mashatu area the game is plentiful. The Tuli area is home to one of the largest herds of free roaming Elephant south of the Zambezi and you are almost assured of great viewing of these incredible creatures. After lunch and a siesta you will take a gentle ride in the cool of the afternoon to explore the Kanda area. Dinner is prepared over an open fire and enjoyed in the thatched lapa overlooking the river. Day 3: An early wakeup call heralds a new day and breakfast is served around the log fire pit. Today, your journey takes you through the heart of Mashatu to the ancient rock formations synonymous with the Limpopo valley. Giant Baobabs silently surveying the land as they have for centuries, ancient elephant trails stamped into the soil and wonderfully long canters around the open scrub. This ride brings you to the banks of the Motloutse River and amongst dense old Mashatu trees a Leadwood Boma that we call “Kgotla” after the old tribal court that was once held in its enclosure. The open-air traditional African enclosure gives perfect security to nights spent under the stars and a unique experience of the African bush up close and personal. The afternoon activity on day three is a guided walk to the “Amphitheatre”, an ancient and awesome rock formation. Your walk concludes with traditional sundowners looking out over the Motloutse River. Back at “The Kgotla” dinner is enjoyed around a large log fire. The night is spent in the comfort of your bed set within the boma but with a ceiling provided by the southern skies, a blanket of stars to send you to sleep, a truly unique experience and just about as far away as you can get from city life and the modern world. Day 4: Is a choice of either a morning and afternoon ride exploring the amazing sandstone formations including the famed Solomon’s Wall. Some of the oldest civilisations in southern Africa had their settlements in this valley, their kings safely nestled in royal kraals at the tops of these flat topped hills. The Mapungubwe topography is ancient and timeless, and combined with great wildlife sightings, it is certainly an incredible riding experience. Or the group may prefer a long morning ride and an afternoon excursion to the nearby village of Lentswe Le Moriti and the basket weavers followed by a trip to the Mmamagwa hills. At the end of a short easy climb and beneath a beautiful Baobab you are rewarded with a breathtaking view of the Tuliareawith SouthAfricato thesouth, ZimbabwetothenorthandBotswanaaroundyou, this isa sundowner drink you will remember for many years to come. Day 6: Todays ride is one of the longest and promises great game viewing from horseback as we explore the Pitsane river valley. The Pitsane has a spring high in the hills which provides regular drinking holes along its course to draw thirsty herds of game. An area where history has it there was a skirmish during the Boer war and Bryces store, an old supply post was destroyed. There was once a stage coach line called Zeederbergs that ran from the cities of the Transvaal in South Africa to the newly forged settlements of Southern Rhodesia, now Zimbabwe. Those coaches crossed the broad Limpopo and followed the Pitsane River crossing into Zimbabwe at our next nights camp, fittingly called Zeederberg. That afternoon we visit a year round waterhole where there is a good chance of seeing elephants who often come for their afternoon bathing. Day 7: Our ride today meanders its way through the beautiful plains between the Mojali and Pitsane Rivers. Abundant with game and with spectacular views into the Limpopo River valley we work our way back to our base camp, Two Mashatus. With the feel of a returning traveler you will be greeted with a cool drink around the pool and treated to a homecoming lunch in the Lala palm lapa. That afternoon we ride to one of the nearby koppies for a pre sundown drink. As the final day draws to a close you may take to your tent for a peaceful and dreamy last night in the bush. Day 8. Your last ride in the Limpopo valley is a great opportunity to snap one last picture of elephants and a long and winding canter through the scattered Mustard bush with your guides. Arriving back at the stables with plenty time to enjoy a hot shower and a tasty brunch you get to say farewells to safari companions and newfound friends, it’s time for your onward journey. Two Mashatus Camp: Nestled in the shade of a Mashatu tree with two traditionally built Lala palm rondavel dining and lounge areas. Accommodation is in big A-frame walk-in tents pitched on teak platforms with an en-suite bathrooms. Each tent is private and positioned in the shade of a tree with a small deck area in front on which to relax during the afternoons. Majale River Camp. Rustic cabins set atop the Majale River. A beautiful thatched lapa dining and rest area set in the shade of a thicket old Mashatu trees. Accommodation is made up of two twin room units with each unit sharing a bathroom separate flushing toilet and secluded outdoor showers. As well as a large fixed site tent with adjoining outdoor bathroom. The Kgotla: The Kgotla is an old tribal court from a nearby community, which was relocated to the banks of the Motloutse River on the western periphery of Mashatu. The boma is an open-air traditional African enclosure made up of Leadwood logs. Guests sleep on beds around a large log fire which sits on a hearth in the centre of the boma. • Rate is inclusive of accommodation, riding, meals, teas / coffees, drinks, game drives, bush walks and laundry. Only transfers, tips and curios payable locally in cash. • Elephant, lion, leopard cheetah and hyena country. • Children under 16 please enquire, strictly no under 12’s. Equitrekking filmed this ride for its "Equitrekking Botswana" episode on PBS! Practical Horseman's managing editor Stacey Nedrow-Wigmore took this horse safari in Botswana, Africa and wrote about it for Equisearch.com. "Our guide "West" Mmanoko slung a rifle over his shoulder as we headed out into the bush. Guides always carry rifles, whether in a vehicle or on horseback, to keep guests safe. It was comforting to know someone had my back should I fall off while being chased by lions. We saw many animals--herds of impala, a family of warthogs and wildebeest. Impala are quite common and plentiful in the bush." The riding was fantastic, Botswana is a beautiful country. To see all the wildlife was really great and the hospitality of the people was fantastic. A personal, detailed guide to Botswana, its history, culture, attractions and natural history. With color photographs, maps and excellent travel information. This British series of guidebooks is noteworthy for its focus on culture, nature and responsible travel. It covers the Okavango Delta, Chobe, Northern Kalahari and other popular destinations in detail. Whatever You Do, Don’t Run is a hilarious collection of true tales from top ­safari guide Peter Allison. In a place where the wrong behavior could get you eaten, Allison has survived face-to-face encounters with big cats, angry ­elephants, and the world’s most unpredictable animals—herds of untamed tourists and foolhardy guides whose outrageous antics sometimes make them even more dangerous than a pride of hungry lions!